1) "Members of the Democratic National Committee who legally reside in the state"
2) "[The] Democratic President and Democratic Vice President (if applicable)"
3) "All of [a] State’s Democratic Members of the U.S. House of Representatives and the U.S. Senate"
4) "The Democratic Governor (if applicable)"
5) "“Distinguished Party Leader” delegates who legally reside in the state (if applicable); [Persons who qualify as Distinguished Party Leader” delegates are: all former Democratic Presidents or Vice Presidents, all former Democratic Leaders of the U.S. Senate, all former Democratic Speakers of the U.S. House of Representatives and Democratic Minority Leaders, as applicable, and all former Chairs of the Democratic National Committee.]" Unlike pledged delegates, who are allocated proportionally to the popular vote in each state, superdelegates are free to support whichever candidate they like—regardless of what percentage of the people voted for each candidate. However, superdelegates don't officially make up their minds until the Democratic convention, which starts on July 25th. Despite this fact, early on when the presidential campaigns started ramping up, you'd frequently see, in the mainstream media, the numbers of pledged delegates and superdelegates lumped together and shown as the sum total with no explanation provided of the difference between these types of delegates. This, of course, gave the impression that Hillary Clinton was performing much better in the primaries and caucuses than she actually had been, because early on, several hundred superdelegates had already claimed that they would be supporting her at the convention. It's an incredibly misleading tactic which fed into the mainstream media narrative that Hillary Clinton is going to be the inevitable victor; they could point to the total delegate count and, because Hillary already had hundreds of superdelegates behind her right off the bat, they would say "Wow, she just has such a commanding lead. There's no way that Bernie could catch up. He should just get out of the race." And, of course, many Bernie supporters who weren't aware at the time that superdelegates were included in that count could be discouraged from going to vote after hearing this message repeatedly hammered into their skulls by the media. So this is one way that the superdelegates have biased the Democratic nomination heavily in favor of Hillary Clinton. Eventually, perhaps after Bernie supporters complained enough and sufficiently badgered the media on this tactic, they began to separate the superdelegates from the pledged delegates, but early on when the primaries were just beginning, you saw this biased presentation a lot more often. Another problem with superdelegates is that their allocation, thus far, is massively out of proportion with the popular vote in each state. Let's look at the data in a couple of different ways to demonstrate this. First, let's look at the totals of pledged delegates—which are awarded proportionally to the popular vote—and compare them to the totals of superdelegates. Thus far, according to Wikipedia's delegate count, the pledged delegate counts are 2219 / 4051 for Hillary and 1832 / 4051 for Bernie, or 54.8 and 45.2%, respectively. The superdelegate counts, on the other hand, are currently 581 / 714 for Hillary and 49 / 714 for Bernie: 81.4 and 6.9%, respectively. So if you compare the overall tally of pledged delegates against superdelegates, you'll see that the latter are hugely biased in favor of Hillary, who had 54.8% of the popular vote but has earned 81.4% of the superdelegates. Compare this to Bernie, who earned 45.2% of the pledged delegates, but has only earned 6.9% of the superdelegates! Looked at another way, the pledged delegate discrepancy is 9.6%, compared to the unpledged delegate discrepancy of 74.5%. It's also worth crunching the numbers to demonstrate that it's quite possible, at this point, for Bernie to still end up winning the Democratic nomination if he manages to flip superdelegates away from Hillary and in support of him. Ever since the California primary—and arguably even before that—the mainstream media and a lot of people have been treating the Democratic nomination as a done deal, acting as if Hillary has won and Bernie has lost, and that's the end of it. An examination of the numbers shows that this is not the case. Delegates needed for nomination: 2383. If all superdelegates switched to Bernie, the current totals would change to 2219 and 2546 for Hillary and Bernie, respectively. To overtake her, Bernie would need exactly 551 / 714 superdelegates, leaving Hillary with 163 / 714 superdelegates, leaving them both with a grand total of 2383 for Bernie and 2382 for Hillary. Obviously this is a very tall order. I'm not exactly holding my breath anticipating this happening, given that I think these superdelegates are intentionally rigged in favor of Hillary, but it certainly is still possible, as an inspection of the numbers demonstrates. Maybe if one of her many scandals finally catches up to her, or maybe if Bernie sufficiently argues to the DNC that he's the better option to beat Trump, perhaps they will switch sides and back him. It's certainly possible at this point. To reiterate, they don't officially make their minds up until the Democratic convention, which begins on July 25th. And if these superdelegates really are looking out for the best interests of the Democratic Party itself, you'd think they'd be supporting the candidate that has been and currently is polling better against Trump in a head-to-head, general election matchup. Let's take a look at the Real Clear Politics averages of Bernie vs Trump and Hillary vs Trump from February 1st—the day of the Iowa caucus—to today, June 16th. As we can see, Bernie has consistently beaten him. There was not a single time during this period where Trump was anywhere close to beating him. 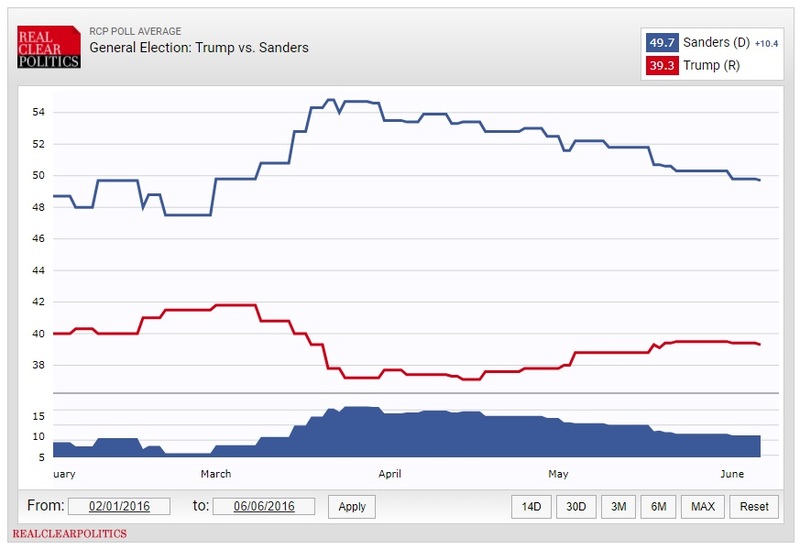 But if we compare Hillary to Bernie, we see that, while she has still done better than Trump most of the time, there have been some periods of time where they've been dangerously close, and Trump even briefly surpassed her near the end of May. If your number one goal was to elect a Democrat as president and keep a Republican—keep Trump, specifically—out of the White House, wouldn't it be safer to support Bernie, who has consistently smashed him in polls, rather than Hillary, who has been fluctuating for months in head-to-head polls against Trump? The superdelegates are obviously not doing this, even though an inspection of the data makes clear that this is the safer bet. So if they're not looking out for the Democratic party, in general, who are they looking out for? If you're wondering how long superdelegates have been around, they were only implemented in 1984 at the request of the Hunt Commission, which was headed by Governor Jim Hunt of North Carolina. So it's not like this is some long-standing tradition within the Democratic party; it's a relatively new phenomenon. But how long they've been around is irrelevant, because I'd be just as opposed to them whether they've been around for a hundred years or ten years. "Unpledged delegates exist really to make sure that party leaders and elected officials don't have to be in a position where they are running against grass-roots activists. We, as a Democratic Party, really highlight and emphasize inclusiveness and diversity at our convention, and so we want to give every opportunity to grass-roots activists and diverse committed Democrats to be able to participate, attend and be a delegate at the convention." So you "want to give every opportunity to grass-roots activists . . . to participate . . . at the convention" by having 15% of the delegates disregard the will of the people and drown out the votes and the very desires of these grass-roots activists? This statement makes absolutely no sense. This is textbook double-speak: She says one thing, and then contradicts it in the very next sentence. Let's look more closely at the first sentence of her response, because I think this one is much more telling: "Unpledged delegates exist really to make sure that party leaders and elected officials don't have to be in a position where they are running against grass-roots activists." Can you even believe what you're reading? She's basically saying superdelegates exist to protect the Democratic political establishment from the will of the people. This is straight from the horse's mouth. There was another interview, this time on MSNBC, where Debbie was asked by Rachel Maddow to talk about the superdelegates. Debbie said that the function of superdelegates is to "make sure we maximize the ability of real people to participate in our convention." "Real people", she says. Well, who are these "real people"? As I described at the start of the post, these are political insiders. And as she said in the other interview, their function is to counteract the will of grass-roots activists. You'd think, if anyone, grass-roots activists would be seen as "real people", but apparently they're, what, unreal people? This is a very telling phrase: The Democratic members of the Washington establishment are "real people", but all of us ordinary voters are just too simple-minded to be worth caring about and we should just scurry away and leave these real, important people to decide what the future of our country will be. And this is much worse than a gentle shove in the direction of Hillary Clinton. We're talking about the subversion of the democratic process. The votes that are cast by the population that our government is supposed to represent are being overruled and drowned out by 714 superdelegates who are free to disregard the percentage of people that support one candidate versus another, superdelegates who can instead declare their allegiance with whichever candidate they choose to. For decades, we've already had an incredibly difficult time having the government actually represent the interests of the majority on things like defense spending and social programs. This is just another step in that direction, and it's a particularly dangerous one, because it makes it dramatically more difficult for us to even elect into office the politicians that we support. And I really don't think it's a coincidence that the vast majority of superdelegates are supporting Hillary Clinton, the establishment candidate, the friend of Wall Street and big business who has accepted millions of dollars in donations from the big financial institutions—Goldman Sachs, Bank of America, Citibank, JP Morgan Chase—and a variety of other incredibly powerful and wealthy corporations including General Electric and Verizon Communications. I would argue that these organizations are supporting her because, despite whatever she says on stage, she represents their interests. Otherwise, why would they spend millions of dollars funding her campaign? It seems reasonable to assume that they're expecting some return on investment; they expecting to benefit from her being elected. And it's especially ludicrous to think that they're funding the campaign of a person who's going to crack down on them, who's going to force them to pay more taxes and stop exploiting loopholes, ultimately chipping away at their profits. Or, who knows, maybe these gigantic, profit-bloated corporations have had a change of heart recently. Maybe they're disturbed by income inequality and the influence that big money has on politics, maybe—just maybe—they've had an epiphany, and have realized that the best solution, for the greater good of mankind, is to elect Hillary Clinton so that she can crack down on these problems and get our house in order. You're welcome to believe that. I don't. Even if you're Hillary Clinton's biggest fan, and even if you despite Bernie Sanders, what's important to understand is that democracy itself is being undermined here. This is something that affects all of us. And if it so happens that during the 2016 election, the superdelegates are biased in favor of the candidate that you happen to support, what happens in 2020 or 2024 or 2028 when superdelegates support somebody you don't like—when they support somebody whose political platform you think would be incredibly harmful if enacted? So there's much more at stake here than just Bernie Sanders vs Hillary Clinton. We're talking about the very survival of the democratic process, which superdelegates are a tremendous threat to.